The governments are moving away from an age of innovation and towards the Age of Imagination”, even as we seek to optimise the potential of Globalization 4.0, the era where technology and globalization are seamlessly intertwined, said UAE Cabinet Minister and Minister of Cabinet Affairs and The Future Mohammed Abdulla Al Gergawi. 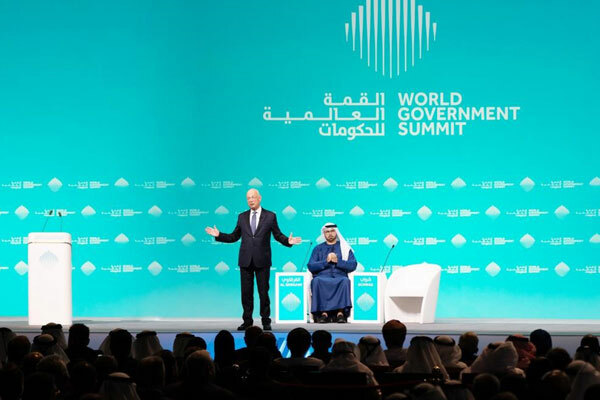 Al Gergawi was speaking today (February 10) at the opening of the seventh edition of the World Government Summit (WGS) in Dubai. Prof Schwab highlighted the inability of governments to keep pace with developments in technology as a core concern and articulated the need for enhanced awareness of the depths of change. Following the opening session, Prof Schwab engaged in a dialogue with Al Gergawi about the need for cities to become platforms for the creation of entrepreneurship-focused ecosystems that encourage imagination and innovation as the key drivers of global competitiveness. During his address at the official opening ceremony, he identified the speed of change, global transformation from a unipolar to a multipolar world and the new wave of populism, where people do not want to be left behind, as the main stress factors exerting pressure on the global system. Prof Schwab listed the imbalance caused by rapidly evolving technology, the challenge of data protection, and the breakdown of social and ecological systems as threats to the world in the age of Globalization 4.0. “We have to change course. We have to move from globalization to a new type of globalization – what we call Globalization 4.0 – which is in line with the modern world, with the Fourth Industrial Revolution, with a multi-polar world,” he stated. According to Prof Schwab, the Globalization 4.0 was a more sustainable, more inclusive environment where all stakeholders of society – including women, youth, NGOs, businesses and governments – participate in the process of change with a renewed moral code to reinstate trust in leadership through addressing challenges such as corruption.